To date SAE Systems have distributed MagnumSpike to many Police, Military and counter terrorist organisations worldwide and within the UK. Shipment is done either from our UK office or direct from our partners at Phoenix International in the US. The patented spike design works on all vehicles types from ordinary sedan vehicles to HGV’s and heavy plant type vehicles, unlike hollow type or solid type spikes MagnumSpike has a fluted design that makes a large and deep puncture in the target vehicle tyres and ensures 3 points of controlled deflation per spike. The unique design of the Wrap&Roll system has the added benefit of being extremely fast and easy to deploy with minimal training. Additionally, due to the compact size of the unit, it can be carried in the front of the chase vehicle without having to first retrieve in from an especially made rack in the boot of the vehicle. Likewise, it can be carried in a backpack or even attached to a webbing belt which is useful for military or on foot tactical uses. Across the UK, US and around the world, through thousands of successful stops, there has not been a single reported adverse incident since day one! A 100% safety record! All units are provided with comprehensive training videos and manuals, and all systems are available in training versions using neoprene spikes. MagnumSpike is not available for sale to the general public, only Police, Military or Government agencies are eligible. In certain circumstance civilian organisations engaged in security operations are also considered. Over the years MagnumSpike has proved itself time and time again in hundreds of trials including the UK Home Office and National Institute of Justice and has been deemed fit for purpose by both organisations. Tests carried out by the UK Home Office in the presence of other Police organisations at Woodbridge Airfield in Suffolk showed that MagnumSpike was extremely effective in its ability to stop vehicles within a significantly shorter distance than other devices whilst at the same time not compromising safety or controllability of the target vehicle. Thereby demonstrating MagnumSpike’s ability to offer much greater predictability over the vehicle’s stopping distance and enable Police Forces greater ability to contain the target vehicle in a live situation. Several live tests were carried out on a range of different front and rear wheel drive vehicles at speeds of 40mph, 60mph and 70mph. In all cases, it was clearly demonstrated that post-impact with the device the vehicles were brought under control within a very short distance without the target vehicle losing its ability to negotiate turns successfully and without any additional risk to the occupants. 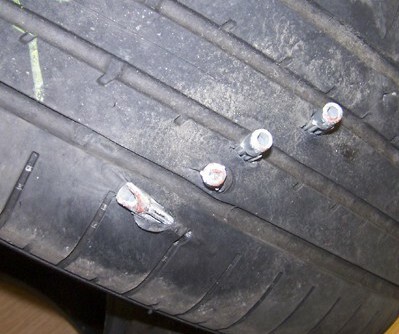 Whilst no-one can guarantee the success against run flats with any tyre deflation system MagnumSpike has demonstrated both in the UK and the US that with proper coordination of force assets the damage imparted on a run flat by MagnumSpike is such that if the target vehicle if corralled or forced into a series of turns the target vehicles run-flat tyres are compromised after one or two miles of pursuit. In response to requests from the UK Police MagnumSpike is now available in a 12m/40ft system designed for use on Motorways and wide dual carriageways. The additional length means Police units can now effectively close all lanes of a motorway with a single system. The MagnumSpike 40ft systems currently used in the UK are now used throughout Europe and the Middle East successfully ending pursuits.